Deep in the heart of the country famous for its horticultural products, there appeared a place where the production of fruit and berries has a different meaning. 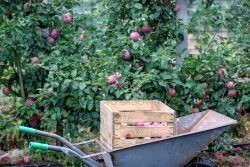 Our passion is to discover old and interesting varieties of fruit trees which have often been forgotten. Many people have memories of the look, taste and smell of the old fruit varieties, but cannot remember their name. Those are the varieties we collect, buy from the collectors or acquire from foreign private collections. Typical tree growing is not the most important activity for our tree nursery; we are also engaged in other activities related to growing, use and saving fruit trees and shrubs from oblivion. We would like to offer our clients the seedlings of fruit trees and berry shrubs. However, this is not all; we also offer the tastes which many people remember from their childhood (we have old traditional varieties): species and varieties you cannot buy in a supermarket. You can buy these breeds only from us. Below is a list of the most popular varieties in our collection. Please contact us if a species or a variety you are looking for is not on the list. Maybe we have this variety or know where to find it.